a) That ISKCON leaders have now basically begun agreeing with the IRM virtually in toto to try and bait followers with the plea that they are following Srila Prabhupada and accepting him as the Guru, while they are just like ritviks (officiating priests) – please see BTP Special Issue #2.
b) That this tactic of agreeing with the IRM is part of The Great Guru Hoax, Part 3, where a guru re-defines himself like a ritvik to distract from the fact that he is actually taking all the benefits and worship of a regular diksa (initiating) guru (or a ritvik re-defines himself like a diksa guru to get all the benefits of a diksa guru) – please see BTP issues 19 and 20. These two themes are dramatically illustrated here in a lecture entitled “The Importance of Accepting a Guru in one’s Spiritual Life”, given by ISKCON GBC votedin guru HH Hanumatpresaka Swami (“HPS”), excerpts from which will be given in the tinted panels below. Srila Prabhupada is the diksa Guru – stupid! 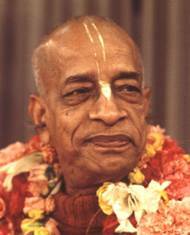 HPS here tells us that Srila Prabhupada is our diksa Guru because he is the one who tells us we need a diksa Guru, and if we do not understand this, we must be “stupid”. Srila Prabhupada is the diksa Guru – it’s natural! HPS here says that it is very natural that we should “just take initiation from Prabhupada”, meaning Prabhupada should be the diksa Guru. Here HPS states that, using the correct definition of a diksa Guru as the person who represents Krishna and establishes the contract between us and Krishna, then Srila Prabhupada is the diksa Guru. HPS here says that it is permissible for those whose ISKCON gurus have fallen to then take Srila Prabhupada as their diksa Guru. Having already stated multiple times that Srila Prabhupada is the diksa Guru in ISKCON, HPS now makes it clear that he himself is not the diksa Guru. HPS reconfirms that he cannot possibly be the diksa Guru since he is not self-realised, but rather a madhyama-adhikari* still full of material desires. *a devotee whose advancement in spiritual life is midway between the neophyte (kanishtha) and advanced (uttama) stages. HPS now goes further and says that actually he is only a ritvik, since he is not someone who has an intense relationship with Krishna. HPS here claims that he can be a diksa Guru for some people in some sense, depending on how much he can “handle” and “hang on” to them. So now HPS claims that initiations in ISKCON today are actually coming from Srila Prabhupada. But whenever Srila Prabhupada gave initiations he considered them as coming from his spiritual master. Therefore the ISKCON diksa gurus are diksa gurus in the same sense as Srila Prabhupada was for his disciples, which means a full diksa guru. They simply consider that their initiations are coming from their spiritual masters. In the middle of the lecture HPS announces that he is actually a diksa Guru since he will be giving a second initiation to a disciple! HPS: “Ritvik, it is interesting in terms of diksa guru in ISKCON. Kadamba Kanana who was originally initiated by Bhavananda prabhu and then took initiation from, you know, Jayadvaita Maharaja, under the approval of his guru he is now taking disciples. HPS is here asked about the “conclusion and real understanding” regarding those who argue about the need for everyone to only be “ritvik representative” based on Srila Prabhupada’s July 9th, 1977 letter. HPS answers this by saying ritvik “is interesting”, and that’s all! Instead, he goes off on a tangent about the fact that in ISKCON even the disciples of Prabhupada’s disciples are also initiating. HPS states that actually the GBC could not even figure out who is the diksa guru if an ISKCON guru falls, and just gave up trying to do so, and basically now allow a free-for-all. 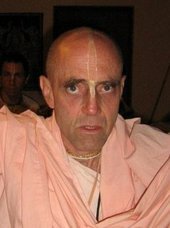 Regardless of the schizophrenic self-contradictory nonsense he has spoken here, in practise HPS knows exactly what he is doing, attempting to act as a fullfledged diksa Guru for his disciples, with worship, Vyasa-puja offerings and all the other benefits which go along with acting as a “good-as-god” ISKCON diksa guru. In practise, he does not act as a ritvik at all, nor allow people to become initiated as Srila Prabhupada’s disciple, with himself acting as the ritvik priest for such an initiation. Rather, he simply gives every possible answer that someone could wish to hear, to be “all things to all men”, and keep the guru show on the road. Anything can be said, as long as in practise the same guru hoax can continue to be perpetuated. That someone who is supposedly acting as a diksa guru in ISKCON himself, as the transparent via medium to Krishna, could speak such contradictory gibberish in the same talk merely illustrates the entangling nature of the guru hoax. The Great Guru Hoax has, therefore, as it moves into its third phase, evolved in such a way that ISKCON has had to develop multiple personality disorder to even be able to explain and justify it. What makes the situation even more farcical is that the guru hoaxers also have the temerity to tell us that Srila Prabhupada’s desires for initiations after he departed are also very “clear” to them! The only thing which is clear is that they are literally making this up as they go along, as evidenced by the same guru giving every possible answer in the same talk. The true and clear unchanging path is that given by Srila Prabhupada himself, as documented in his books, conversations, directives for ISKCON and his Last Will and Testament – that the system of initiation he established for ISKCON (the representative ritvik system of initiations, with himself as ISKCON’s sole diksa, or initiating, Guru), would be identical in ISKCON for all time to how it operated when he was on the planet.